The ArrayEditor is a widget for graphically editing a spectrum. It consists of two plots and a control point area. The plot on top shows the current and modified spectrum. The other plot shows the difference between the current and the modified spectrum. The Control point area shows details on the control points that have been defined. The spectrum can be modified by adding control points and moving them along the vertical axis, either by setting the value in the controls area or by dragging them in the plots. 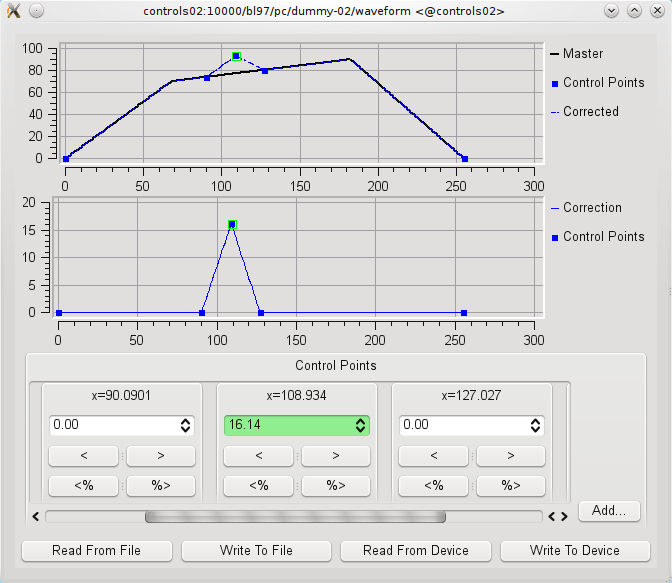 Control points are added by double-clicking in a position of the plot or by using the Add button (which allows the user to define a regular grid of control points). The currently selected control point is highlighted both in the plots and in the controls area. The arrow buttons in the controls area will help in propagating the related value to the other control points to the left or to the right of the selected one.